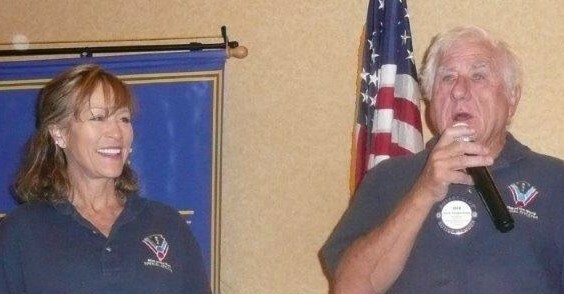 Jack and Kim Meers presented the Rim Special Athletes program. Kim summarized all of the things they have expended into. They now offer 4 different areas of activity: Yoga, Snow Play, Water sports and golf. The yoga program takes place in a local church gym, and at Tavern Bay Beach Club. They are excited to have a certified trainer working with them. The golf program has really taken off. It takes place at the Country Club, and they are really happy that a number of members of the club have volunteered to instruct the participants! The Water Sports program has had a great summer with paddle boards, kayaks and pedal boats. Jack worked with the Firefighters Union, and managed to arrange a visit, tour and hands-on experience with the Fireboat! The Snow Sports season is coming up, and they are excited to show-off heir facility at Snow Valley during their upcoming Fundraiser. The Fundraiser is scheduled for October 6, come up and check it out – ride the chairlift and have a delicious Italian dinner!